According to discussions to appoint members of the selection committee of parliament, the speaker named 5 for the government and 7 for the opposition, today. Members of parliament protested about the less number for the government party. 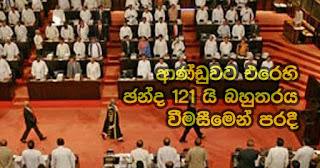 settle the crisis of appointing members of the parliament selection committee the speaker Karu Jayasuriya decided to go for a vote in parliament and just then Wimal Weeravansha yelled out and protested against it. Whatever it is, the speaker did not change his decision. The government party then left the House in parliament. "You have made a statement that there is no prime minister in parliament. Those who say 'government' ... I ask them to show the majority. If the majority is shown ... we will give the powers", said Lakshman Kiriella. Anura Kumara Dissanayaka then said, "Law of the jungle is president coming in moonlight and forming a government by bringing in a prime minister. If there is an issue about this selection committee ... it is the parliament who should take the decision. For that purpose a vote should be taken by name". Under these conditions members of the selection committee accepted the process of the electronic system of securing 121 without the government party in parliament. The government party group of the parliament had expressed their opinion to the media by holding a separate meeting at parliament premises itself after leaving parliament. In the meantime MP Mr. Anura Kumara made a speech and parliament was adjourned till 27th.